A set of 120 colored cards with five categories: rhythmic notation; notes on the staff; key signatures; terms and symbols; and intervals. 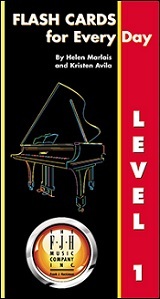 Level 1 is for elementary to late elementary students. Perfect for use at the lesson or at home.